I realized this past week there are still a lot of long time restaurants in Kalamazoo I’ve never been to. Theo & Stacy’s on Portage Road closing this week made me realize that. 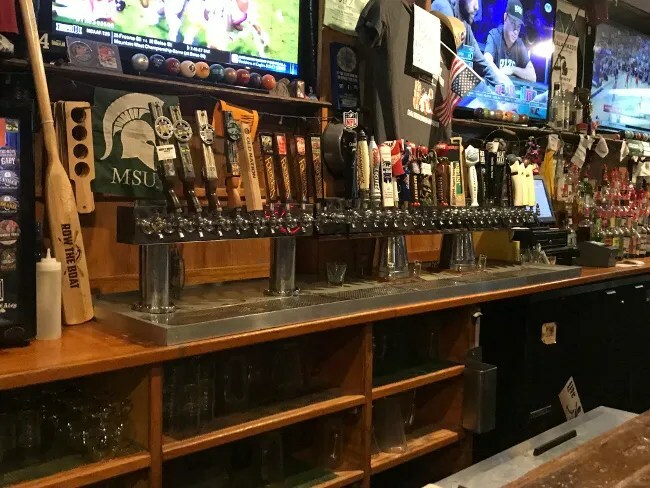 There are hundreds of blog posts on this blog from all over Southwest and West Michigan but there are a few long time businesses that I haven’t been to for some reason or another. Wednesday night J had an event to go to with the kids. It was scheduled to begin before I got off work so she didn’t RSVP me. I ended up getting off work early and could have met them there but J told me to just take the night for myself and go get dinner. 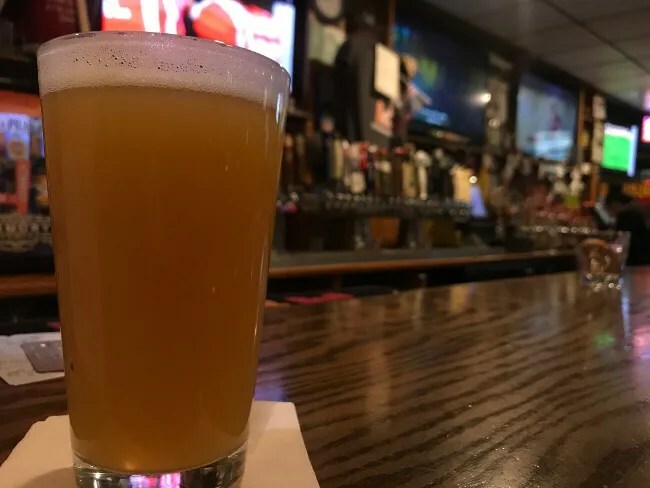 I’ve been putting together a list of bars I still haven’t been to that I likely wouldn’t take the family so it was just a matter of picking one. I picked Ruggers Up & Under because I know their days are numbered. 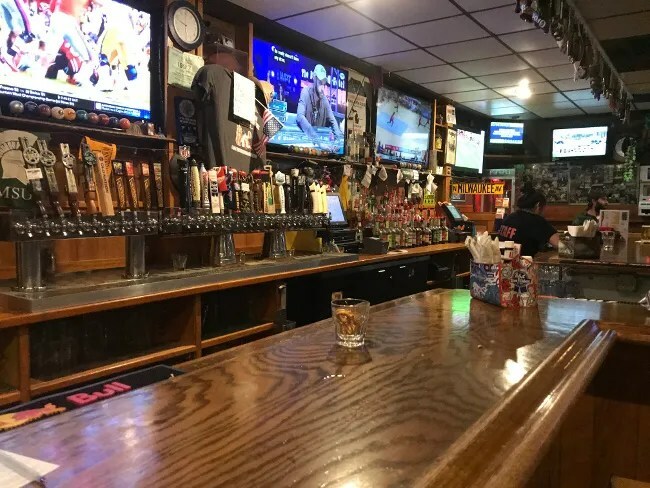 The sports bar has been kind of right on the edge of downtown Kalamazoo on Michigan Avenue right where Michigan Avenue meets West Main Street for about 25 years. 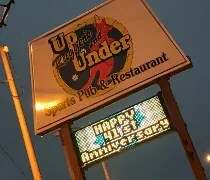 Ruggers Up & Under’s days are numbered because they know they will be shutting down in April of next year. 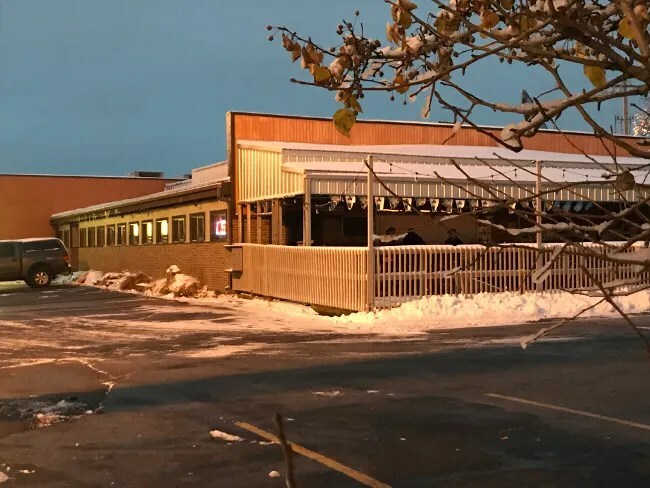 The owner of the business is ready to retire and he put the building up for sale in June of last year. By September, we learned the property has been bought and will be demolished to make way for a new mixed use development. Because of that, I knew I had to visit this place at least once before it’s gone forever. I got off work around 5:30 and headed over to the bar. I honestly had no idea how to even get in to the parking lot. I’ve drove by this place everyday for two years now and I’ve never paid attention. Turns out they have a pretty big lot behind the building accessible off Academy Street. I parked there and headed towards the back door to the building. Up & Under is actually three bars in one. 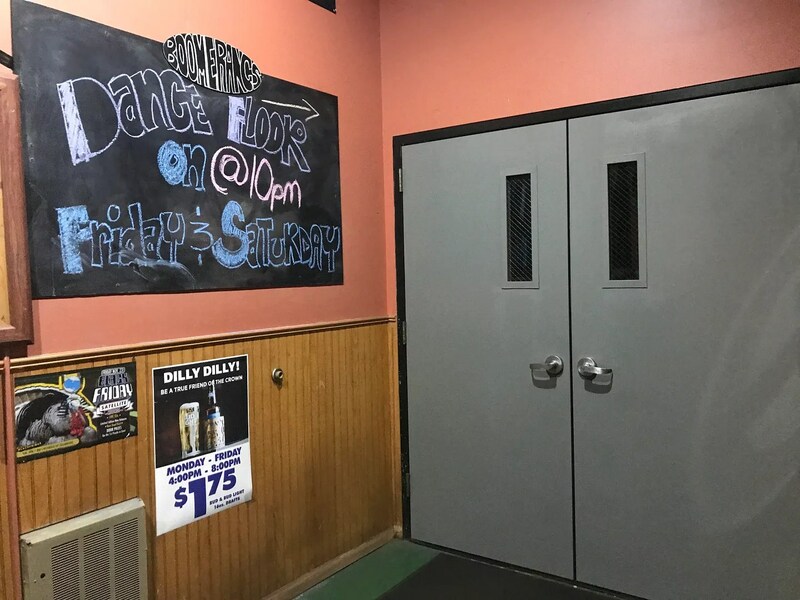 Right as you enter the back door, there’s a sign for Boomerangs which is the dance club open on weekends. 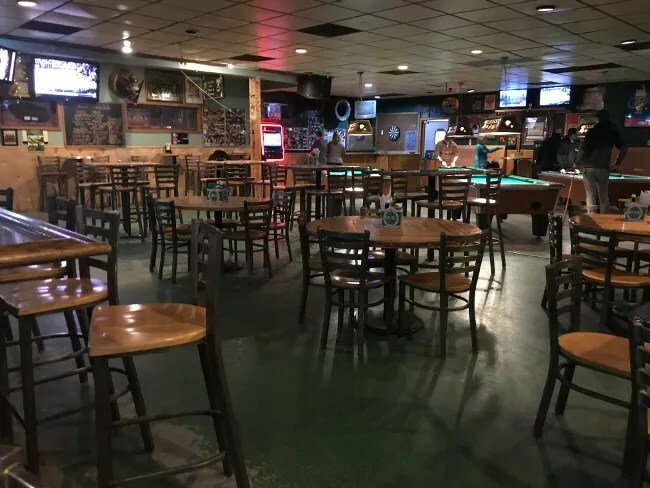 There’s also a Tiki Bar open during the warmer months but what I was there for was the sports bar that takes up the main space in the restaurant. It’s a pretty unremarkable space. A lot of tables packed in to the space, pool tables, dart boards..you know, typical sports bar. I took a seat at the large bar which had more TV’s tuned to the various sports channels. The bar spans almost the whole width of the restaurant. There were a few groups of guys clearly enjoying some after work drinks on one side of the bar. I chose to go to the other side and be a loner. I picked the M-43 from Old Nation because it’s one I very rarely pass up when I see it on tap. 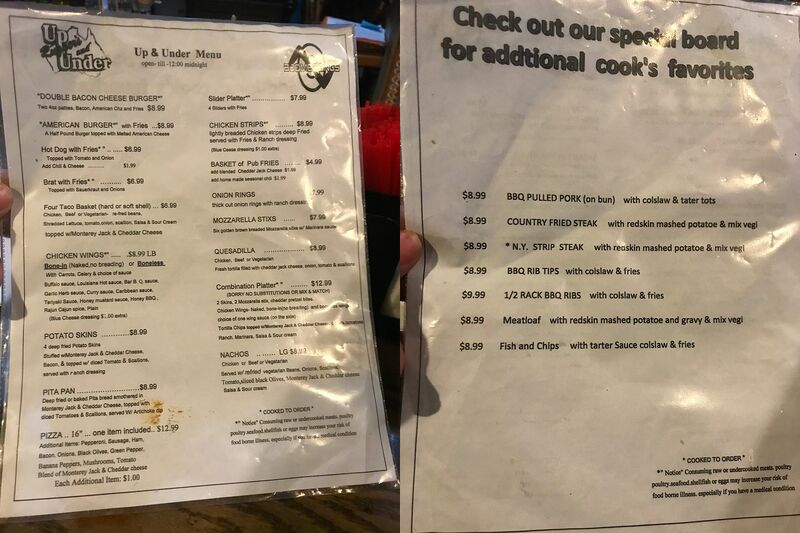 The menu was a little smaller than I thought it was going to be but they have all the pub staples. I noticed later there is also a chalk board with some chef specials on it that aren’t on the paper menus. I wouldn’t have changed my selection if I had noticed that but it’s good to know for next time. I chose to do 1lb of bone-in wings with the garlic herb sauce and a basket of pub fries. A pound of wings is apparently six wings. 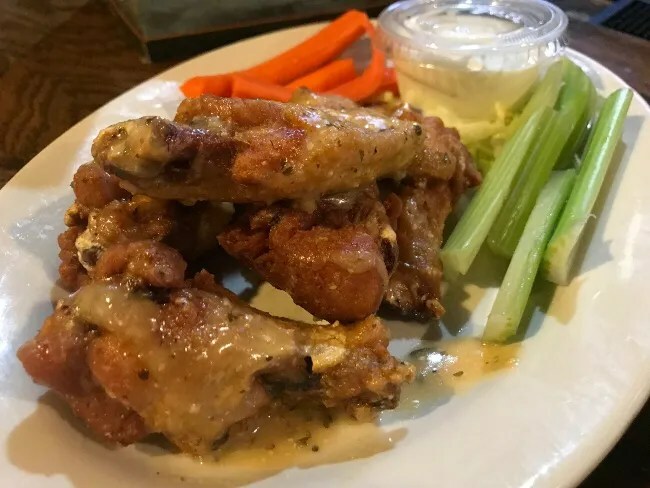 They were big, juicy, crispy wings covered in a creamy, garlicky sauce. They were served on a plate alongside carrots, celery, ranch, and lettuce for decoration. The wings were quite tasty. The garlic sauce was subtle. You know you’re eating garlic but you’re not burping it up all night at home grossing out your wife. 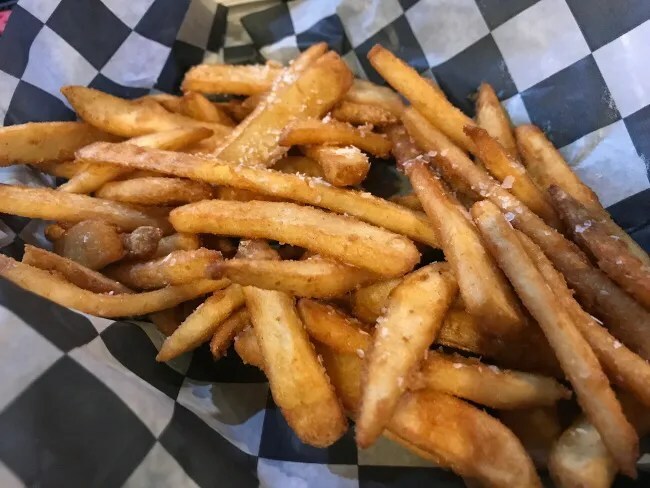 The basket of pub fries is a pretty large portion of golden brown, battered fries with a very heavy salt and pepper seasoning on them. They were perfectly cooked with that crunchy outside and soft, warm, flaky inside but there was a lot of salt. I noticed a bottle of A1 Steak Sauce in the condiment caddy the barttender put down near me so I grabbed that to dip my fries in. They were good fries but needed a little less salt to make them more palatable. My bill for dinner and a beer was a little over $18 before tip and now I can say I’ve been to this place that won’t exist for much longer. 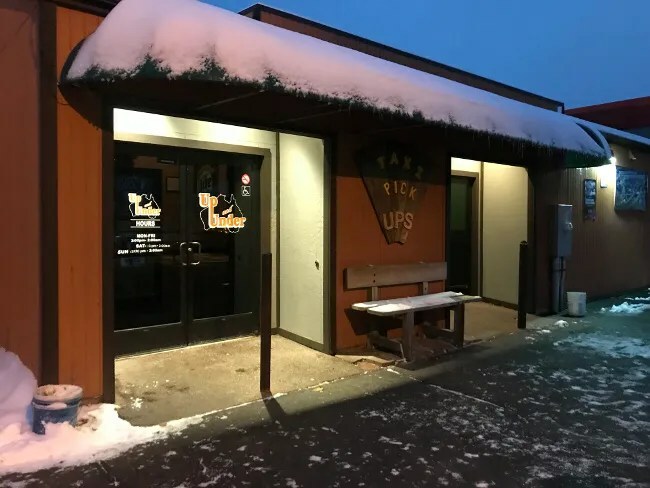 Ruggers Up & Under is a pretty great neighborhood type pub that also goes a little further with the dance club and tiki bar. The bar is right on the edge of downtown but it’s close enough to both college campuses that a person could walk to it if they wanted to. Places like this have to do something right to last 25 years in an area of town that’s not quite downtown but not quite in a neighborhood. I’m sure there will be something that will move into it’s place but I have a feeling whatever becomes of this spot on the corner of Michigan and Main will not quite be the same as what’s there now.